Amal Clooney, Jeremy Hunt and Chrystia Freeland speaking at the G7 event in France. 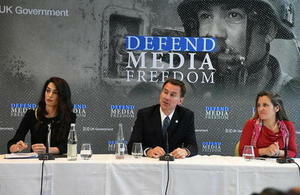 After a meeting with the Canadian Foreign Minister Chrystia Freeland and Amal Clooney at a G7 event in France, Mr Hunt set out the next stages of the UK’s campaign to defend free media around the world. Today’s announcement comes ahead of the International Conference on Media Freedom to be held in the UK on 10 to 11 July, co-hosted with the Canadian Government.